OTHER NAMES: Boletus versicolor, Coriolus versicolor, Coriolus zonztus, Polyporus versicolor, Polystictus versicolor. COMMON NAMES: Yun zhi (“cloud mushroom”) [China]; turkey tails [English]; kawaratake (“mushroom by the river”) [Japan]. NOMENCLATURE: The word “Trametes” means skinny, and “versicolor” means multi-colored. PROPERTIES: Sweet and slightly warm. RANGE: Asia, North America, and Europe. HABITAT: Likes it wet and shady. Often seen growing on rotting Aleurites moluccana (kukui) logs in Hawai’i. PSK and chemotherapy increased survival rates in colonrectal cancer [Torisu 1990, Mitomi 1992], gastric cancer [Nakazato 1994], and leukemia [Nagao 1981] as compared to chemotherapy alone. Proper administration of PSK reduces the incidence of metastatic tumors in lab animals [Ebina 1989]. This may be through the modulation of immune response [Habelhah 1998(a), 1998(b); Matsunaga 1986; Oguchi 1986] and in conjunction with IL-2 [Sakamaki 1992]. It is directly mediated through the lymphatic system [Ebina 1989]. PSK decreases oxidative stress [Kobayashi 1994], boosts NK (natural killer) activity in rats [Kobayashi 1993] and induces interferon in mice at up to eight times the levels of controls [Li 1990]. PSP (Polysaccharide-Peptide) has significantly extended five-year cancer survival and increased quality of life in double blind trials [Kidd 2000]. Ethanol extracts of Trametes may reduce androgen sensitive prostate cancer cells and PSA levels [Hsieh 2001]. PSK is anti fungal against Candida albicans in mice, probably through the boosting of immune function [Ohmura 2003]. PSK boosts antiviral and antibacterial immunity in tumor bearing mice [Taniguchi 1984; Tsuru 1984(a), 1984(b)]. Trametes spp. may be liver protective [Farghali 1998]. Potent inhibitor of recombinant HIV-1 reverse transcriptase [Collins 1997]. Analgesic in mice [Ng 1997]. TOXICITY: Very safe. The reported oral LD5O of PSP is 10.0 gm / kg. In 1987, Japan spent 25% of its’ national expenditure of anti cancer medication on PSK. 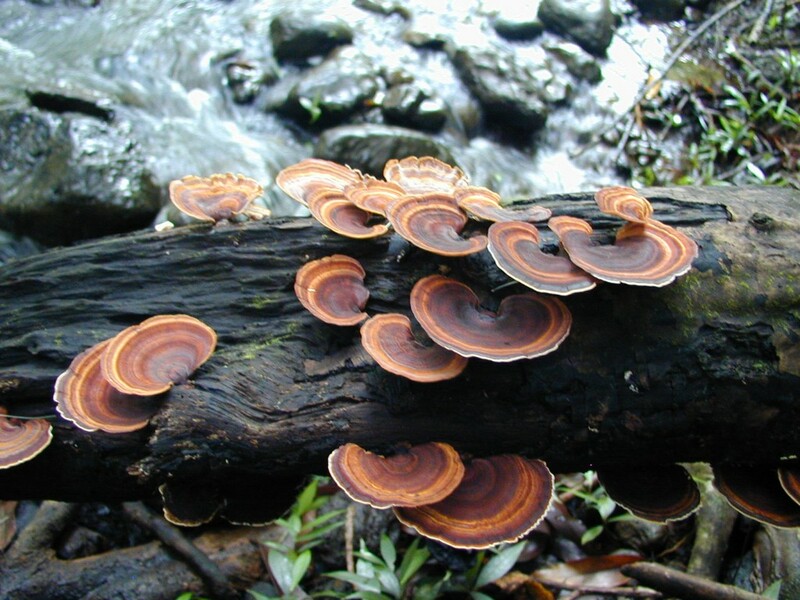 Trametes versicolor is the most common species of the family Polyporaceae and one of the most beautiful medicines in the Hawaiian forest. I have seen huge kukui trees, like fallen warriors, reincarnating into hundreds of these marvelous fungi. Sometimes I am so impressed by their beauty that I am unwilling to harvest them and will search for more humble specimens. Dry and rubbery to the touch, they are a powerful addition to any herbal pharmacy.